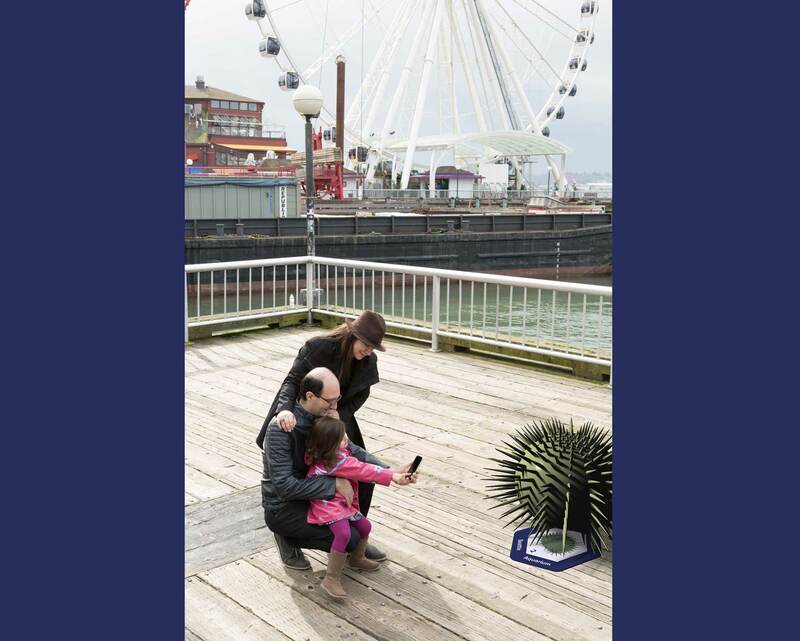 Discovering a city’s museums, zoos, and exhibitions through augmented reality. 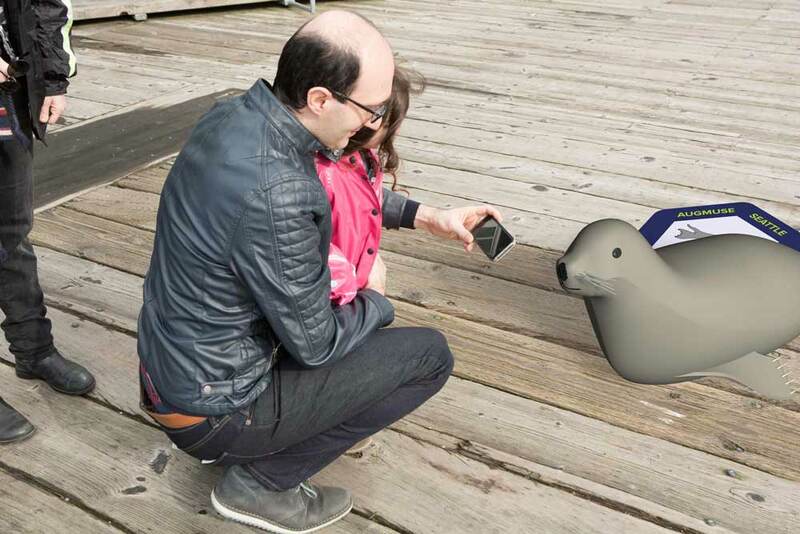 Augmented reality is opening users to new experiences in real time. Finding ways to harness the power of the technology to educate and enrich lives is where applications like Augment have great potential in the marketplace. 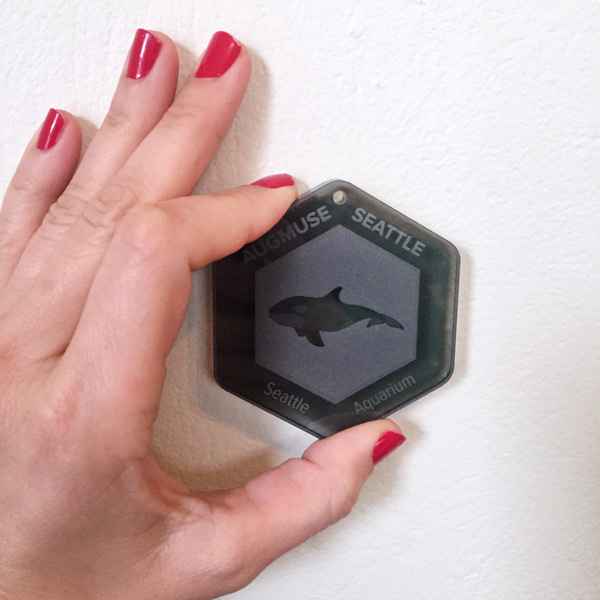 In seven weeks design a brand extension of the Augment App, taking users on a purposeful journey through part of Seattle, including clues, wayfinding, incentives, and a reward structure. 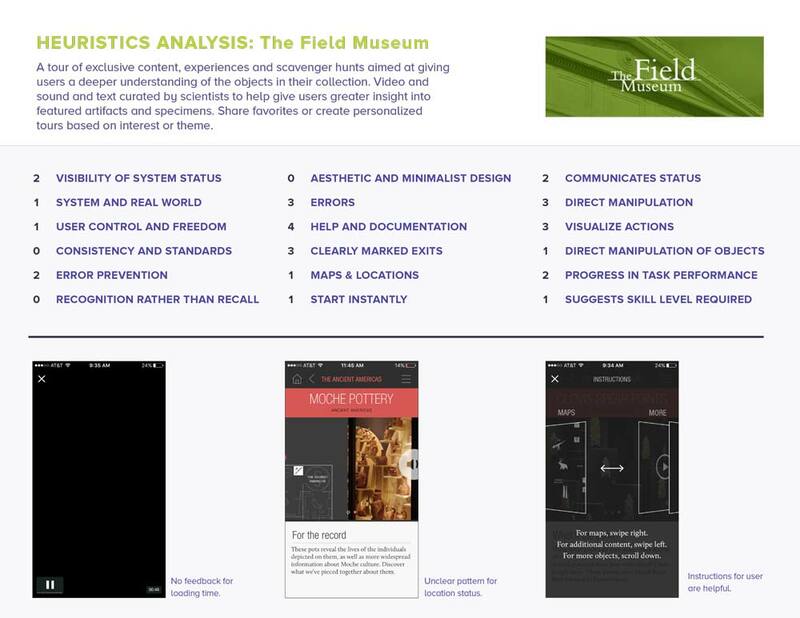 Augmuse — an immersive, interactive experience that brings museum learning into the world, for users of all ages to engage and learn through augmented reality. 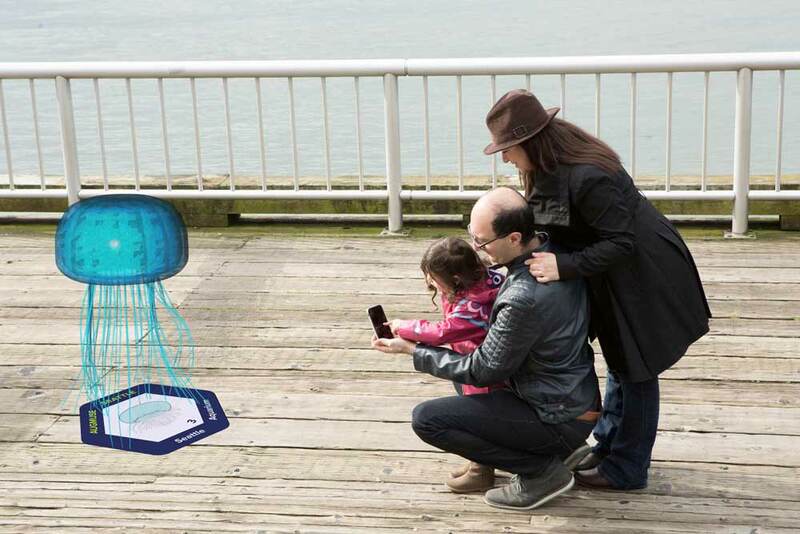 The app leads users on a guided trek from a starting point to a nearby museum or exhibition space, offering moments of shared discovery along the way with 3D models in augmented reality and factoids to further examine the objects users will encounter. Participating museums will receive tokens for young users of the app to win and collect along their journeys. 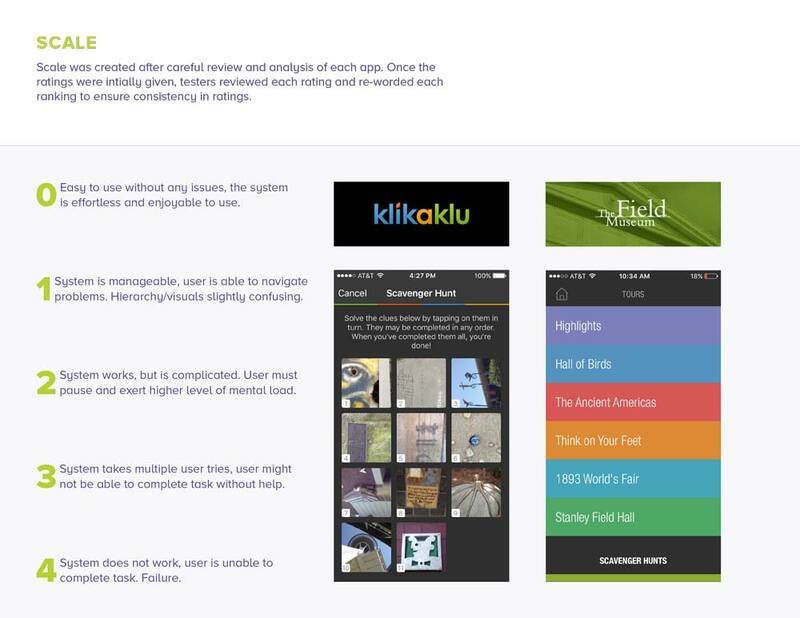 We began by giving identity to the app and setting standards for type and colors. 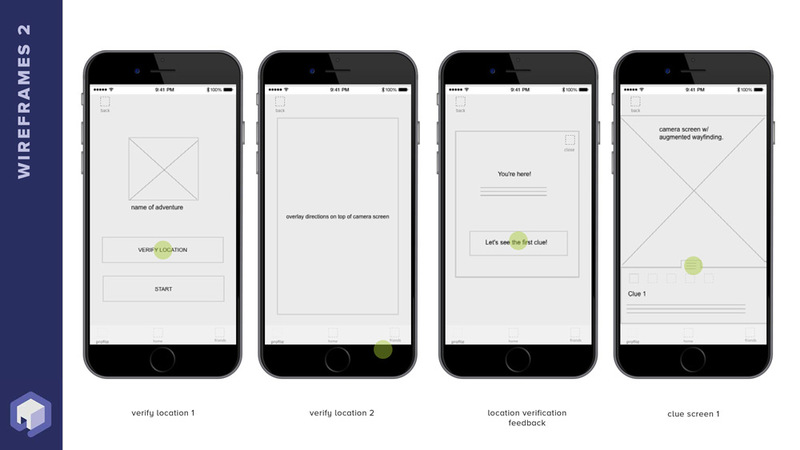 The application is an extension of Augment, so it was natural to give it identity that could link alongside the parent company. 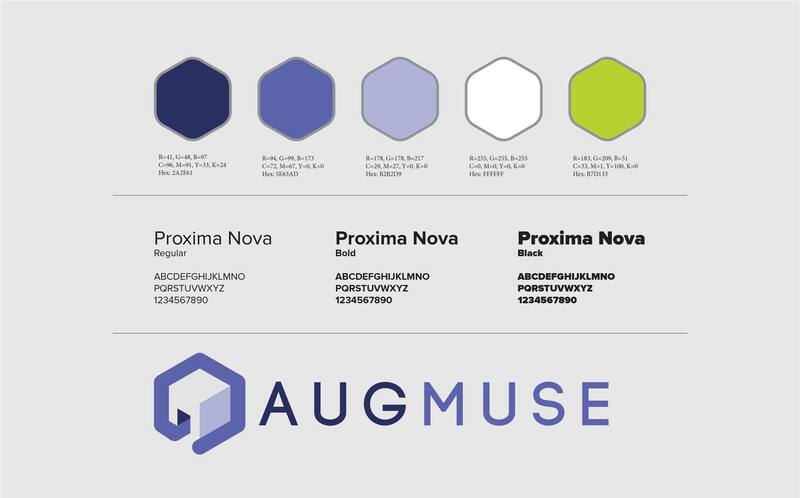 Through research and defining a proto-persona we began to better understand the users of Augmuse and help guide our UX decisions. 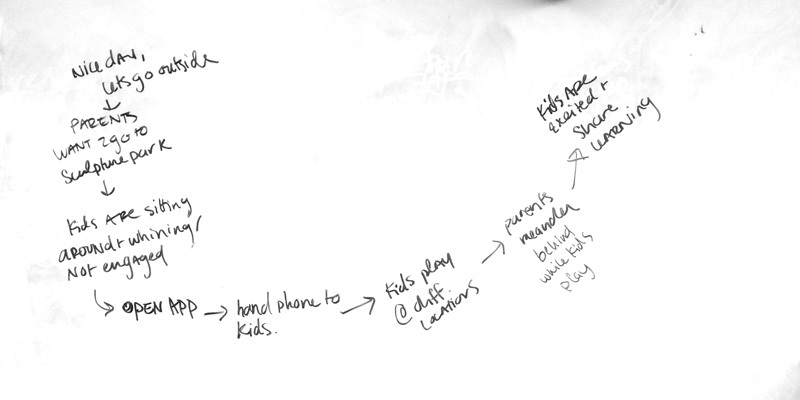 By clarifying the goals and values of our proto-persona we were able to empathize and focus on user-centered design. It was imperative to look at the market and identify usability concerns that have existed with other similar applications. 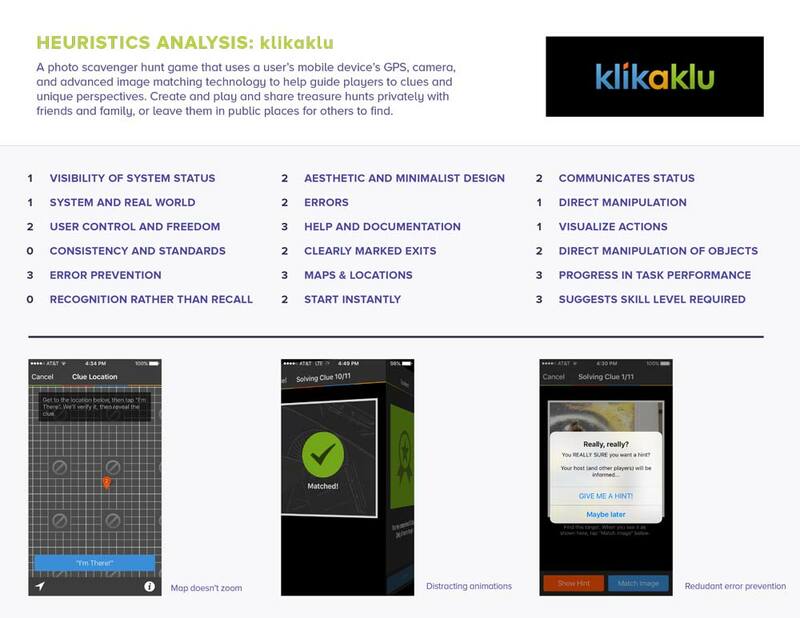 A heuristic analysis was done of two apps similar in nature — Klikaklu, an app for taking users on a city scavenger hunt, and The Field Museum, an app for leading people on tours and scavenger hunts through The Chicago Field Museum. In addition to the Norman 10, heuristics were chosen based on their direct applicability to potential Augmuse tasks. 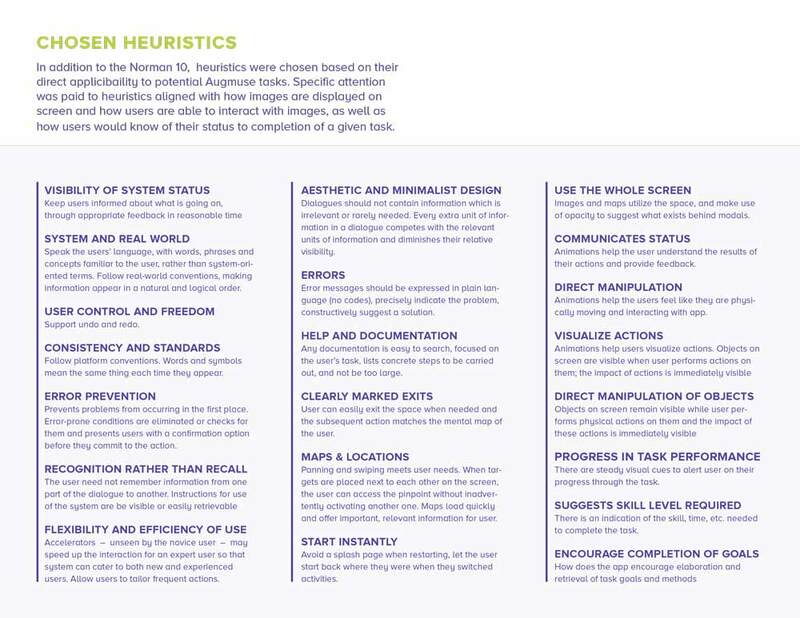 Specific attention was paid to heuristics aligned with how images are displayed on screen and how users are able to interact with images, as well as how users would know of their status to completion of a given task. KEY TAKEAWAY: Simplicity in design will allow augmented moments and museum learning to feel experiential, and keep users returning to the app. 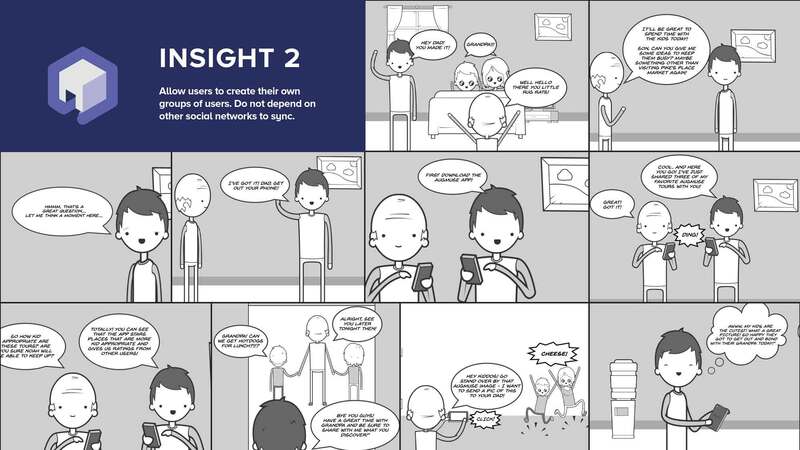 At this point it was time to tap into empathy generation by anticipating the user’s tasks, thoughts, and tactics. 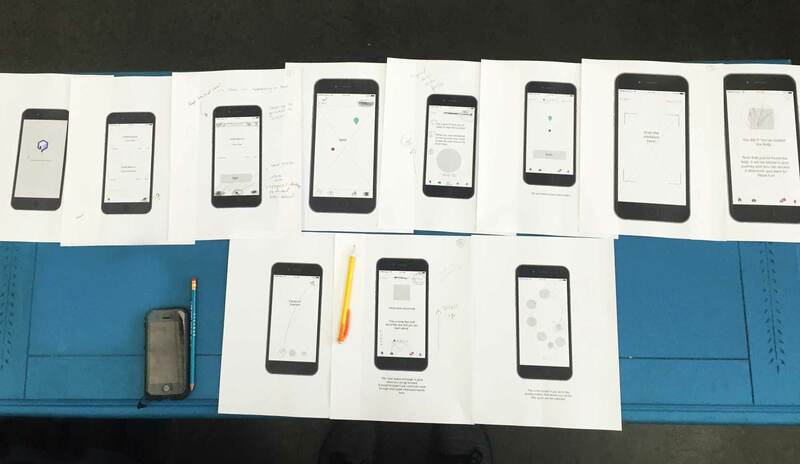 Patterns began to emerge, helping us to further inform the app’s design. 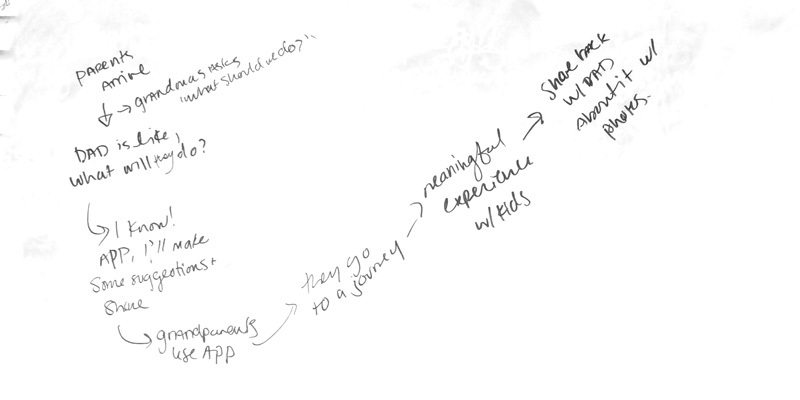 Taking into account the aforementioned goals we storyboarded several scenarios for our persona that exemplified opportunities for Augmuse to go the extra mile in surprising and pleasing the user. 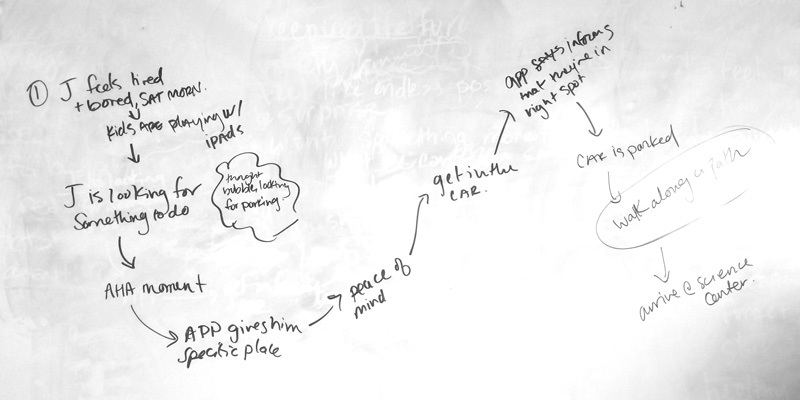 We visualized the flow of the app by using a writing-first approach, weaving in potential app options along the way. 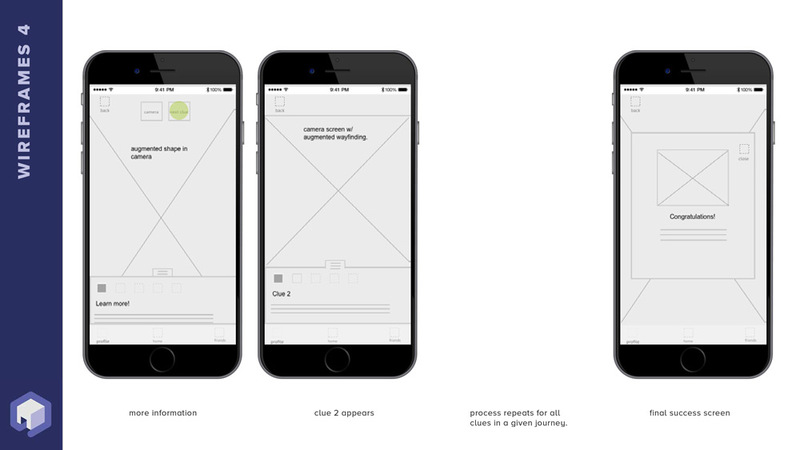 A clear path was developed which allowed us to move into mapping the flow of the app. 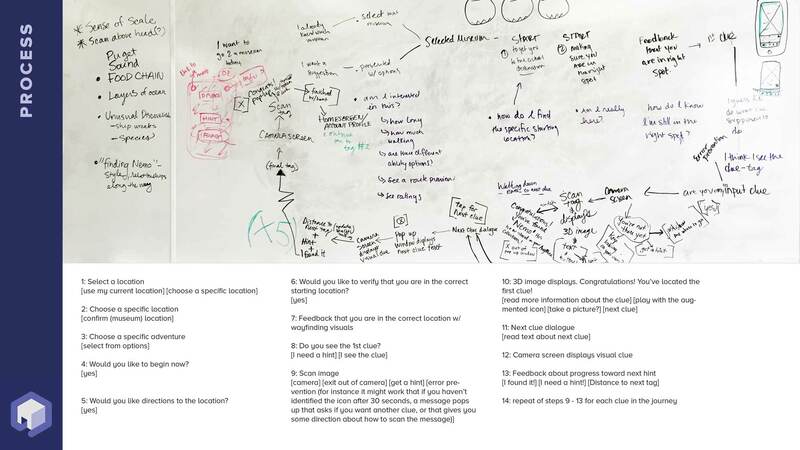 We used Jesse James Garrett’s standard visual vocabulary for consistency in explaining the information architecture and application interactions. 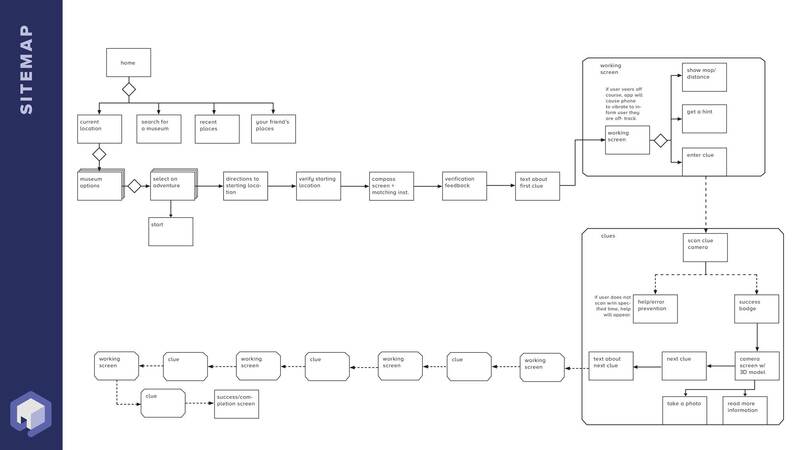 LoFi wireframes were then created from this flow diagram. 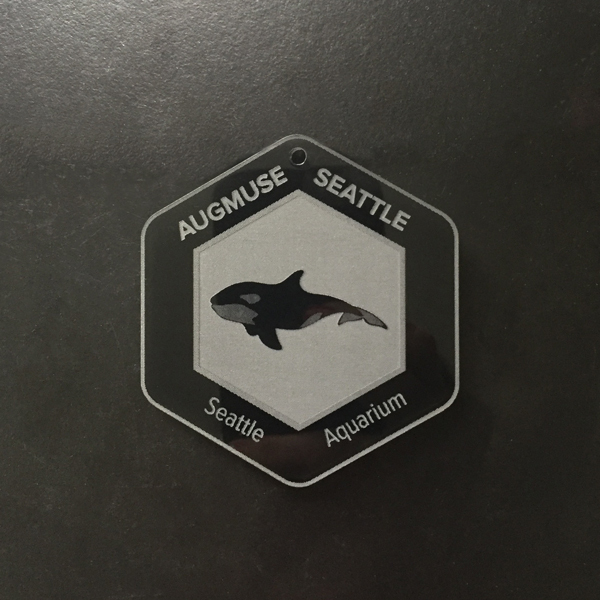 With our task defined we routed a sample journey of an Augmuse user to the Seattle Aquarium. This particular journey would likely be taken with small children, so the distance between targets was adjusted to account for shorter attention spans. 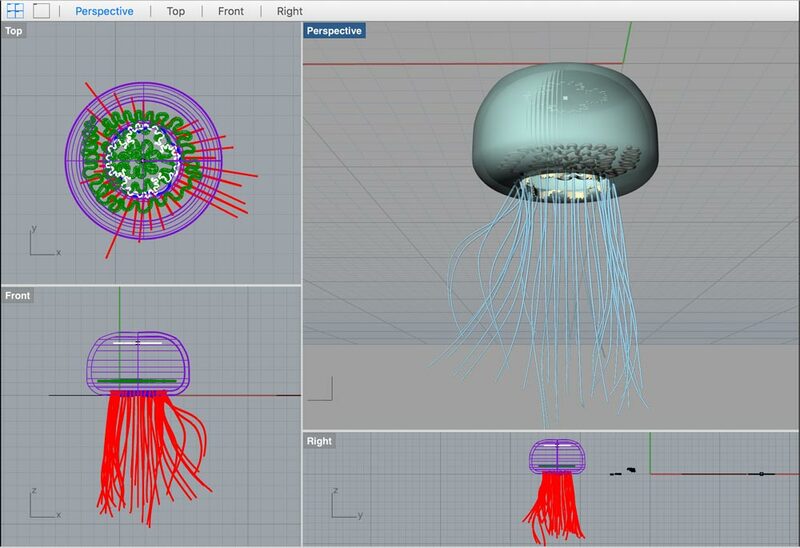 To load a 3D object in the Augment app you assign it a 2D target image that your phone's camera can scan. I used the five steps of the Augmuse Aquarium taskflow to create the five stops along the guided tour. 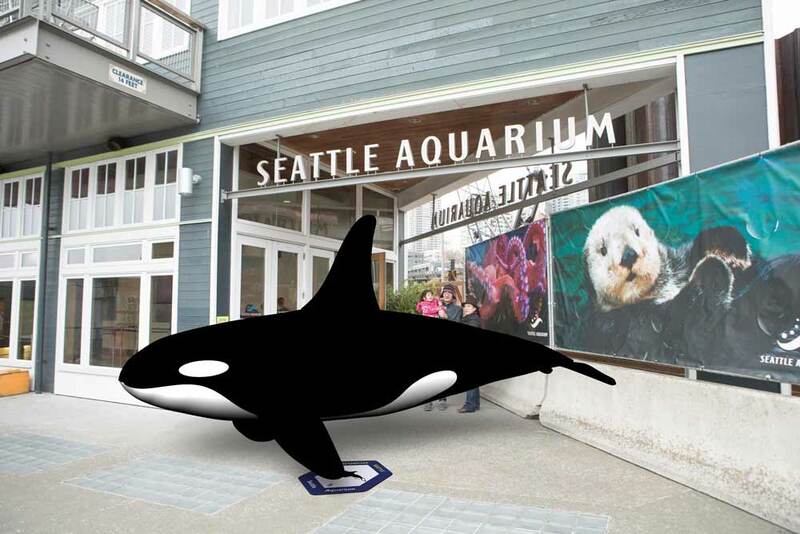 The final stop is at the doors to the aquarium, where users scan to see a full-size orca whale. This became the token image we then laser etched onto semi-transparent acrylic plastic. The token would be an added bonus to youth who play the Augmuse app and can be received from the front desk check-in at participating museums and exhibition centers. 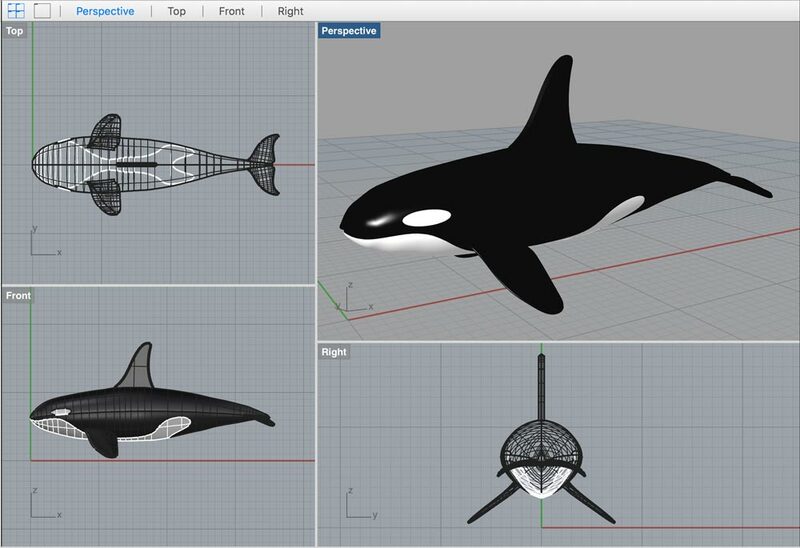 For this project we were required to use Rhino for modeling our augmented objects. 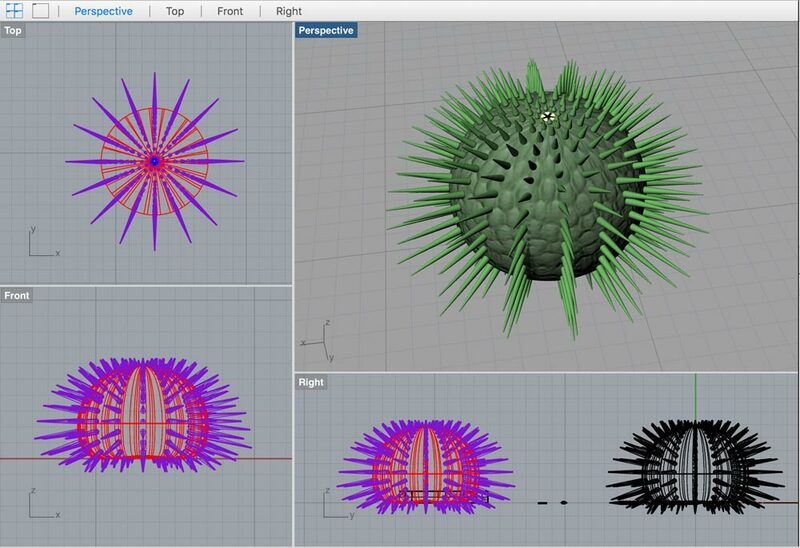 Though the program was new to me, once I got the hang of the commands I found that I truly loved the process of bringing the sketches to life in 3D. 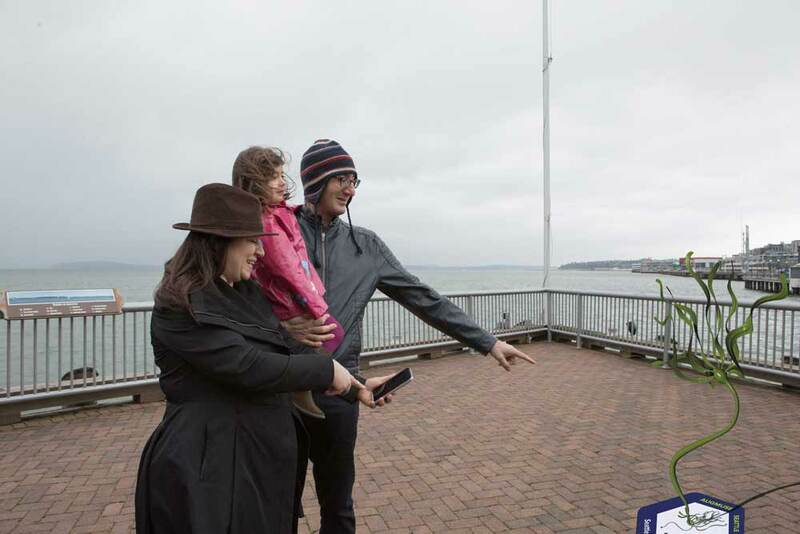 The finished prototype walks users through the experience of using Augmuse to explore the Seattle waterfront and interact with sea creatures along their walk up to the Seattle Aquarium. We worked with a professional photographer to shoot a set of family interactions with the app to be used in the storytelling of our final design.